This Week In Hot Takes: Trent Dilfer calls Chiefs-Rams game "bad ball"
Former ESPN analyst Dilfer was not a fan of Chiefs-Rams. 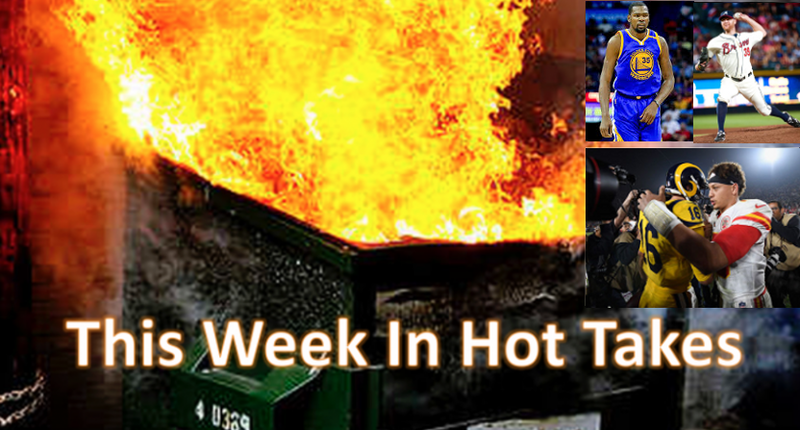 Welcome to a special Black Friday edition of This Week In Hot Takes. Pay $0.00 for one hot take and get four more for free! Thanksgiving might be our best holiday, but the food is overrated. Just plain turkey is boring — there's a reason it's not on many restaurant menus year-round. “I’m out of order! You’re out of order! This whole damn holiday is out of order!” Surely not a controversial stance to take just before perhaps the most food-focused holiday out there. Oh, and the turkey point is also interesting; yes, some (like Spears) don’t enjoy turkey at all, and some only like it with particular sides, but there are a whole lot of people who love it. And the argument that “it’s not on many restaurant menus year-round” is just false; yes, many restaurants don’t serve turkey, but many do, especially diners, where there’s usually a hot turkey sandwich option, a turkey dinner option or both. Maybe Andy just isn’t going to the right restaurants. But hey, if he thinks turkey is boring, that’s more for the rest of us. Trying to dictate how people should dress is a bad idea in general, and this take’s particularly annoying for trying to tell those working from home to abandon what’s comfortable for unspecified reasons. The “slobby creatives” line in the summary is also annoying and unnecessary. And sure, there might be benefits to dressing professionally on a teleconference or in a co-working space, but that’s already known information. This is not a particularly helpful take from the WSJ, especially with how they promoted it on social media. "Tom Brady is the L.O.A.T. – Luckiest of All Time. LeBron is the F.F.O.A.T. – Finals Failure of All Time. Kevin Durant is the M.S.O.A.T. – Most Sensitive of All Time." Around here, we call Parker The W.A.G.O.A.T: The Worst Acronym Generator Of All Time. Congrats to Johnny Venters who came back 6 years later from two Tommy Johns and had a fantastic year. The Cubs Ben Zobrist was clearly the guy . He raised his OPS 124 points -batting average by 73 points and made 1 error while playing three positions and handling 356 chances . First, it’s Jonny Venters, not “Johnny.” Second, it’s three Tommy John surgeries, not two, and Venters made history by being the first pitcher to ever return to the big leagues after three. He also had a fourth “half Tommy John” procedure. And the surgeries weren’t all six years ago; his last MLB game before this season was six years ago. Venters’ comeback (he posted a 3.67 ERA and 27 strikeouts for the Braves this year) is truly remarkable, and it seems a little more remarkable than Zobrist’s comeback from a down year. But the even hotter take is just getting so much wrong about Venters. Kansas City and Los Angeles put on a great offensive show on Monday Night Football, but this is not what the NFL game is supposed to be. I’m not Walt Kowalski. I’m not telling you to get off my lawn, or, in this case, my turf. The Monday night game between Kansas City and the Los Angeles Rams was fun. I LOVED the entertainment factor. I LOVED the excitement. I LOVED the playmaking.It just wasn’t good football by NFL standards. …The NFL is supposed to be a higher level of game. It is supposed to be art. It is supposed to be genius. It’s supposed to combine the art of physical ability and playmaking with the genius of great design and strategy. I know it because I played it. I study it. I wasn’t great at it and I wished I was better, but I understand it. The NFL is supposed to be all the entertainment combined with the intellectual challenge of chess. Instead, what we had was a game that was fun, while at the same time sloppy. The theatre was great. The scriptwriting left something to be desired. To a certain extent, I can’t blame the people involved. Andy Reid is a genius of a play caller. So is Sean McVay. Wade Phillips and Bob Sutton are great defensive coordinators. But when the rules are changed the way they have been this season, the game deteriorates from what it’s supposed to be about. To put it another way, the NFL is becoming something akin to Major League Baseball, where hitters either hit a home run or strikeout because the metrics say that’s what you should do. In the NFL of 2018, you can’t hit the quarterback and you can’t hit receivers after they catch the ball. As a result, offensive coaches such as Reid and McVay realize there is less risk to simply chucking the ball downfield. Pat Mahomes and Jared Goff are great young talents, but they are often just dropping back and winging it. That’s not good football for this level. Again, the NFL is supposed to have sophistication, intellect and class. I’m a football purist. I’m a football snob. The careless turnovers drive me crazy. That’s a remarkably bad football take from Dilfer, and it’s nice that he managed to work a bad baseball take in there too. And just saying that you’re a “purist” and a “snob” doesn’t make your tastes better than anyone else’s. At least he admits he “wasn’t great” at the NFL game (certainly true), but his playing career is also worth considering here for his bias; the best success he ever had was on a team known for its defense, where he was asked to protect the ball rather than make impressive plays. And his skill level was nowhere near what Mahomes and Goff possess. The game has changed, and it’s passed Dilfer by as not only a player, but as an analyst. But fortunately, we didn’t have to listen to him dropping this take on ESPN and ruining the enjoyment of what was an outstanding game. Instead, he put this out there on Twitter and FanSided, and a whole lot of people were able to enjoy a tremendous Monday Night Football contest without ever learning that Dilfer had criticized it. JUST RECIEVED THIS FROM A MEMBER OF THE CANADIAN MEDIA Sometimes I’m embarrassed to be a member of the media. Too many nerds who never played a sport in their life. How a FG kicker wins the ST award over a FG kicker AND an outstanding punter is a joke.